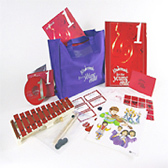 Using a small-group approach to music education, Kindermusik for the Young Child provides a pressure-free class where your child can develop a strong musical foundation by learning the concepts, language, notation, and vocabulary of music and its greatest composers. 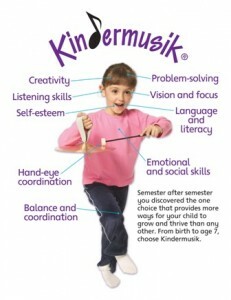 Experts agree that the single best choice for your child at this age is Kindermusik vs. Private Instruction. 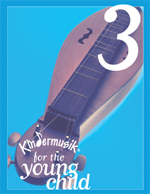 Through the 2-year program of instruction, your child will learn authentic wind, string and pre-keyboard instruments. Upon graduation from Kindermusik, your child will be ready to transition beautifully into private instruction on the instrument which he/she shows greatest joy and aptitude. Piano, Violin and Voice instructors are constantly telling us how “unbelievable” their Kindermusik students are in comparison to children who missed the Kindermusik opportunity. Singing and vocal development — It may sound like a foreign language when a child sings “ta” and “ti-ti,” but this is the language of professional musicians and composers and getting young children ready to read and write simple rhythm patterns. Movement — See children dance expressively to music, giving them the practice they need to coordinate their body movements to the sound of music. This kind of musical play not only improves musicianship, but physical coordination as well. Reading and writing music — Young children will learn melodic notation and identify pitches such as the C, A, and D notes on the treble clef, plus rhythmic notation. Eventually even composing music of their own. Focused listening — Children will learn to identify a range of orchestra instruments and their sound qualities, while also gaining an early awareness and knowledge of composers and masterworks in Western arts tradition. Exploring and playing musical instruments — Authentic percussion, string, pre-keyboard, and woodwind instruments expose children to the many choices for future musical study, and at the same time provide them with the opportunity to musically succeed before taking on more formal instruction. Semester 1 — Children 4 1/2-6 years old LOVE TO SING AND DANCE and the experts inform us that although your young child is rarely ready for the physical demands and commitment of formal musical training, he/she is ready to learn sophisticated musical concepts involved in instrument instruction. 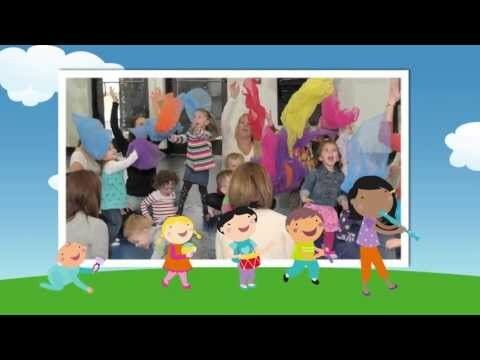 Your child will begin their musical journey learning pre-keyboard techniques, hand-positioning, ensemble development, and vocal development. Because Young Child is concept-specific, children gain an understanding of rhythm, notation, musical symbols, music vocabulary, and composition, as well as music history and styles. Can you imagine a 5- or 6-year-old taking rhythmic dictation? Young Child is the place for just such magic! Semester 3 — We will be building on the concepts introduced in Semester 2, some of which were rhythmic accuracy, musical terminology, pitch notation, auditory discrimination, solo-singing, ensemble playing, and discovering and strengthening the “head” singing voice. We will also introduce Meter Signatures, and move to, write, and sing music in 3/4 and 4/4 meter. Look out – here we go! This 3rd semester of Young Child is exciting. Your child will add 5 new rhythm symbols this semester to add to the 3 they currently know: half-note, full quarter-rest, half-rest, whole-note, dotted-half-rest. Additionally your child will learn 2 more notes: b1, d1 making it “7.” Now that your child knows and can identify instruments from all of families of the orchestra, your little one will now be introduced to their first stringed instrument! This is the pre-violin instrument that will prepare your child for later violin instruction, and what better way to introduce your child to a stringed instrument than through the study of Appalachian Mountain music! Aural, reading and writing skills will be increased and used as your child further develops his/her glockenspiel aptitude. 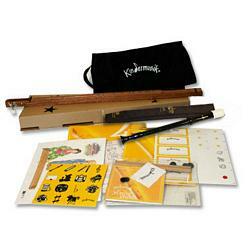 Meanwhile your child will increase their knowledge of notation and writing skills. This semester brings you one-step closer to having your child perfectly prepared for success in private piano or violin instruction. 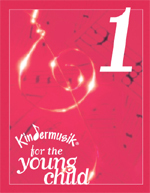 Semester 2 in Kindermusik for the Young Child (ages 5 to 7 years) will excite the young mind as it focuses on concepts such as piano/forte, crescendo/decrescendo, and legato/staccato. We will explore string and woodwind instruments, notation, and even a bit of Beethoven. 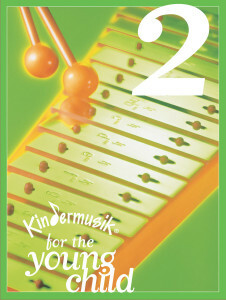 Children love applying their new knowledge of aural skills, and reading and writing music notation as they further develop their glockenspiel skills. Glockenspiels are now utilized at home throughout the week to reinforce the music-reading and pre-keyboard skills of these budding musicians! Lesson highlights of this unit include Tchaikovsky’s famous “Peter and the Wolf,” “The Orchestra,” and a wonderful “Sing and Celebrate!” ensemble experience. 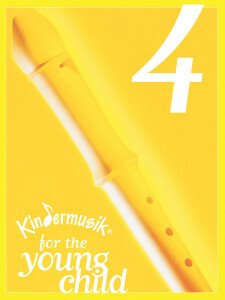 Semester 4 of Kindermusik for the Young Child is the fourth and final semester of this exceptional program. 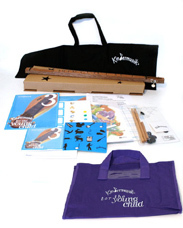 Together we will explore the sounds of wind instruments with the introduction of the recorder, something children in elementary school music education aren’t introduced to until 4th or 5th grade! Musically, students learn about musical form (ABA and rondo), review notation, rhythms, treble clef, and the complete C scale. Regular Four-part rhythmic and musical ensembles showcase your child’s emergent musicianship skills! Music from other cultures includes German-Austrian music and the study of J.S. Bach, Music of the Pacific Islands and the famous Japanese story of Momotarosan. The year culminates in May with Young Child II graduation ceremonies, complete with cap and gown, for all your families and friends! Make a 100% tax-deductible donation to Music Connections Foundation online with your credit card or PayPal account!